— it’s not your Dad’s door any more! 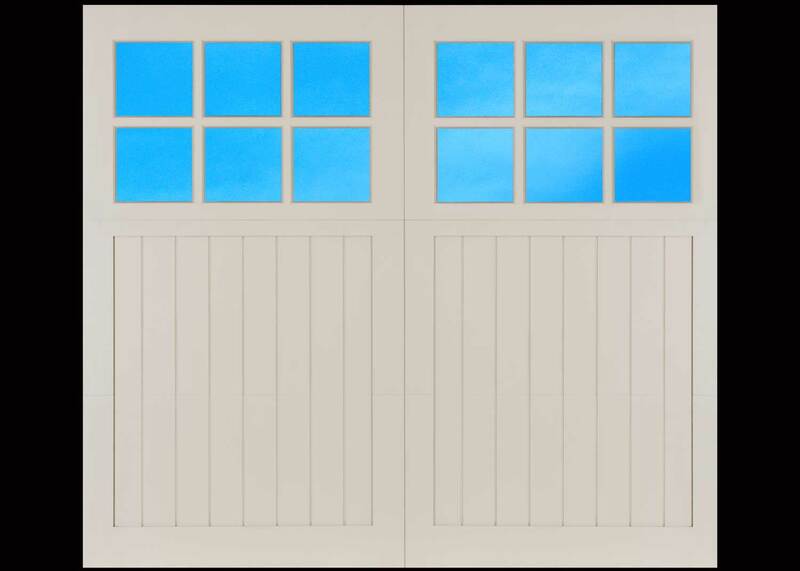 Fimbel garage doors are more sophisticated than any other door on the market today. Fimbel doors are manufactured from advanced materials using patented manufacturing techniques and authentic period architectural designs. We offer you an amazing number of ways to dress up your home and magnify its appeal. Most of our doors are built to order — so if you dream it, we will build it! Our Euro-Dor®, Roaring Twenties, Roaring Twenties Raised Panel, Presidential and Custom Designs are available as swing, overhead or overhead carriage style doors. American Legends and Legacy are not available as a classic swing carriage house door. 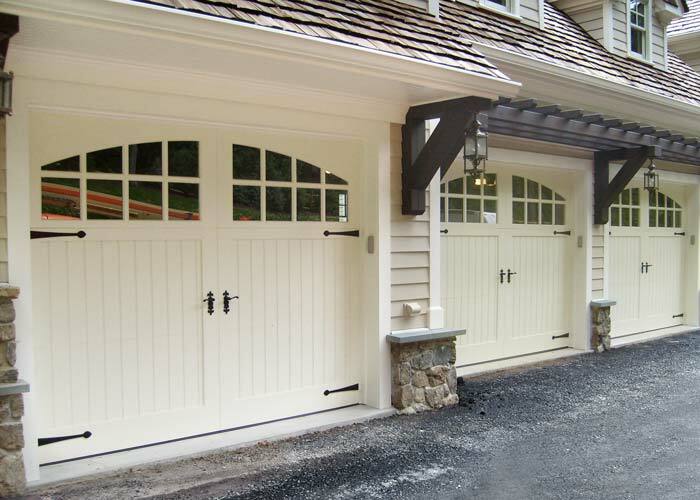 Classic Swing Carriage House Doors — just as they are called, they swing open. Overhead Carriage House — are the best of both worlds they look like they will swing open, but they roll up. See the photo. That’s our RT12-A Yonkers featuring V grooves and handles — that door has the look of a swing door but neatly rolls up. Fimbel door designs are developed from original drawings — many of them from our nearly century old archive of door designs — from Craftsman to Mid-Century Modern. For many folks, getting the design period of their garage door just right is key to making their home a showplace with great curb appeal. Many older homes were built before families owned cars. Once the homeowner bought their first car, they may have added a garage — or perhaps waited even longer to build that luxury for their car. That means that you may live in an early-20th century home but have a garage with a mid-century door design. 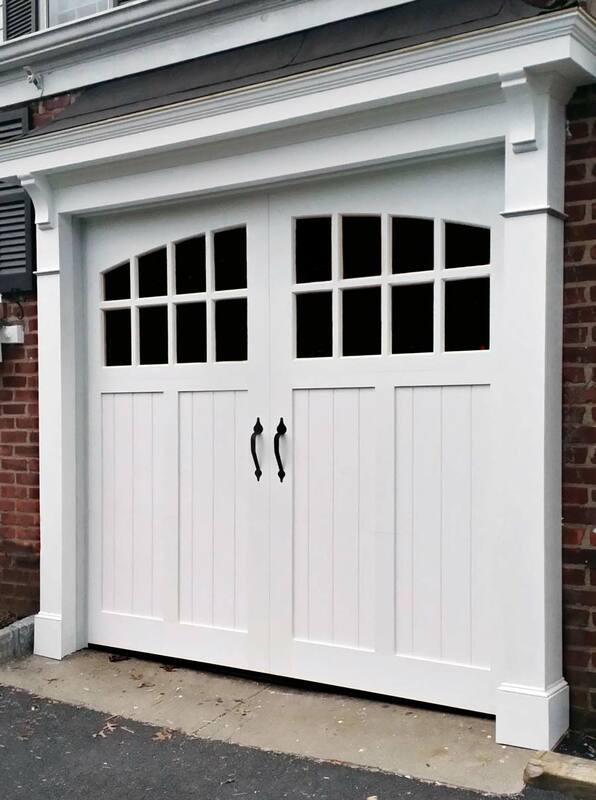 Purchasing the right Fimbel door will align your home’s original period design with that of the garage. For those of you who wish to find a door that is historically true to your home, we’re here to help! Just upload a photograph of your home and our experts at Fimbel will recommend period appropriate door designs. All hardware attachment points are predrilled so the installer is guaranteed to find our wood frame every time for a secure and long lasting installation. 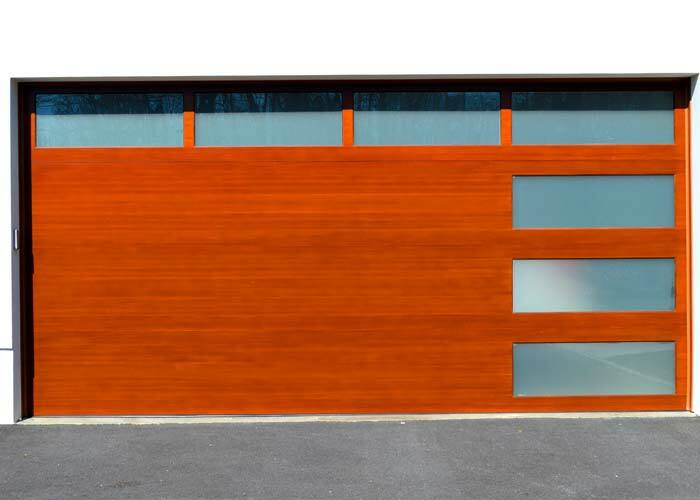 For all our VCT doors we use Versatex® as our primary material which has maintained the tightest color tolerances in the industry for the last 10 years. Versatex® is made right here in America. Our construction methods allow us to construct door sections in 1” increments. Even if you have the most odd-sized opening we can help you with a beautifully built-to-size door rather than having your contractor cut a standard door down to size or have it overlap the opening. This makes a huge difference in the look, fit and the functionality of the door. 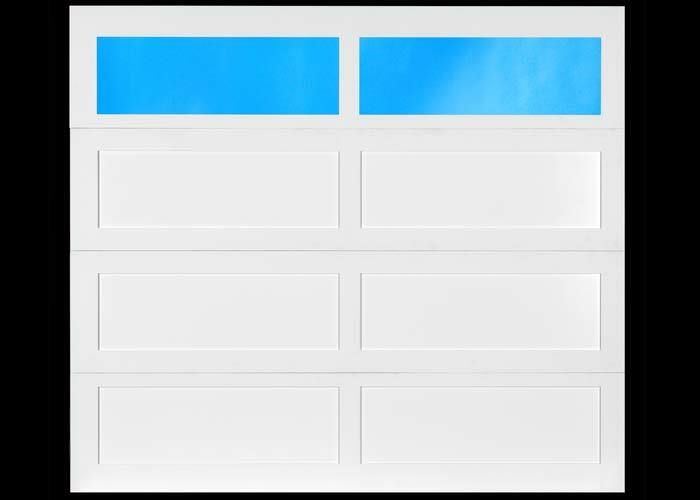 To help keep our doors as cost effective as possible we offer our Standard White Door for doors that will always be white — and never yellow. 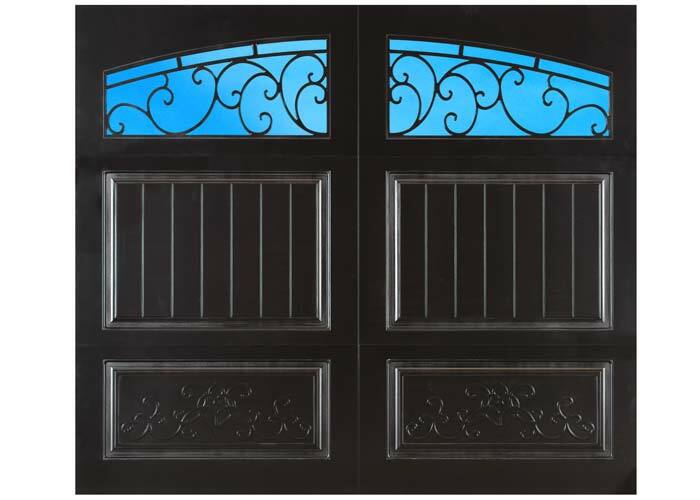 We also offer a Paintable Upgrade Door for doors to be finished in any color other than white. 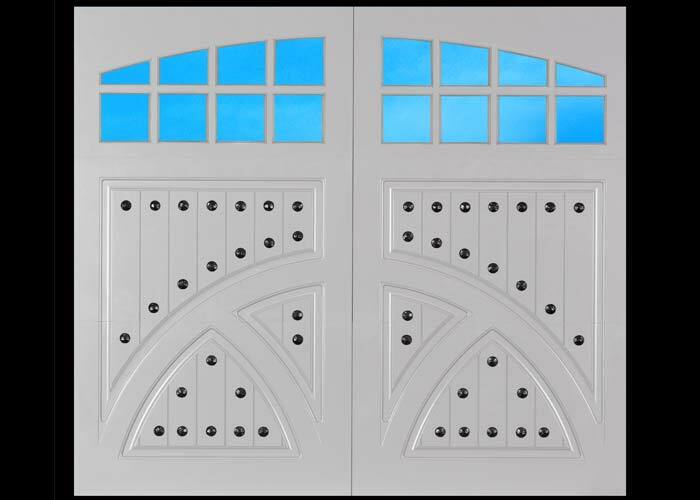 These doors are a slight upcharge and have additional internal reinforcing. 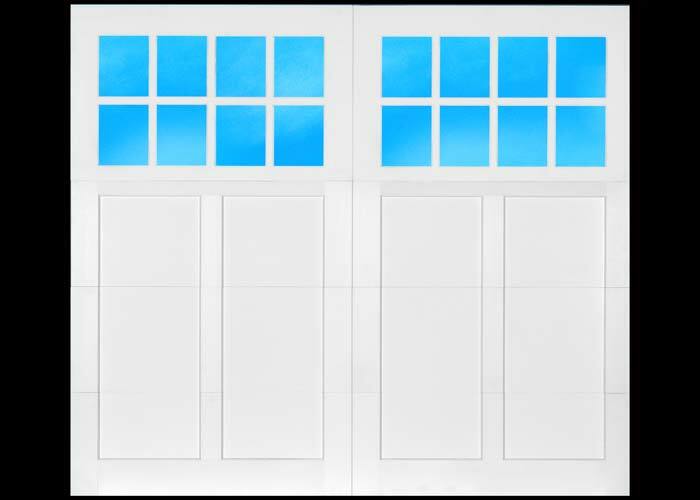 Paintable Upgrade Doors may be factory finished or field finished with Aqua SurTech DIY Paint Kits. Custom color matches are available. Our windows are bigger. Our doors are designed to historically accurate proportions, with a larger glass area then most other doors on the market. Not only do they let in more lites, they deliver a big bold beautiful look. OR, if you prefer smaller lites in your top section, we offer that too! Our glass sections are a solid one-piece grille made from Versatex®, that makes them much more durable. There are no seams in the window muttons for a clean look that will not crack, warp, or gap. The face of the material is smooth which provides the look, feel, and beauty of painted wood without the maintenance. And, since we are cutting the lites from one piece of material, we can provide a very wide variety of grille options for no additional cost. Odd Size Opening? We say: BRING. IT. ON. When we say we build to suit, we mean it!